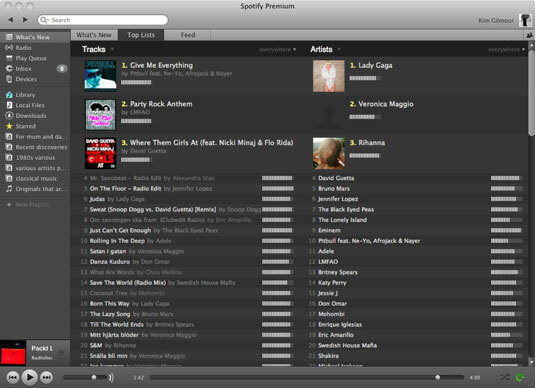 Spotify provides a Top Tracks listing, which monitors what people are listening to within Spotify — think of it as an alternative to the Billboard Hot 100. The popularity bar that appears next to all Spotify tracks is a meter that measures how frequently a track is being listened to — the more people are listening to it, the higher the meter goes. The Top charts do align quite similarly to the official Top 40 countdowns, with the usual suspects continuing to rate on Spotify with the same popularity as the mainstream charts. Lady Gaga, Pitbull, and Rihanna are just some of the acts who are practically off the scale in terms of popularity. To view the Top lists, select Top Lists under Apps in the left sidebar. 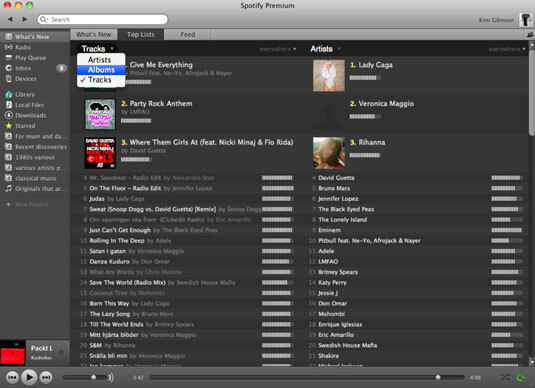 You see two columns, one displaying Top Tracks and the other displaying Top Albums. The titles of what’s currently displaying in each column (top tracks, albums, or artists) are actually menu options — click one to open a drop-down list, from which you can change the type of view (for example, to display Top Artists in one column and Top Albums in another). Everywhere: The most popular tracks, artists, or albums in all Spotify countries combined. By Country: Want to know who’s charting in Norway or France? You can narrow down your view by selecting this option.